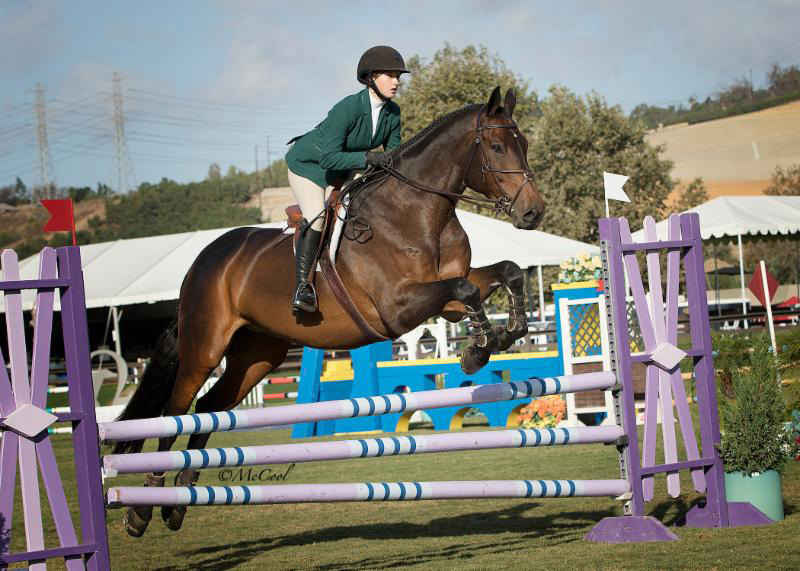 Payton Potter bested a 16-rider field to capture her first ever equitation medal win at the inaugural USHJA 3’3″ Jumping Seat Medal Finals—West, held Sept. 22-23 in San Juan Capistrano, Calif., during the Blenheim EquiSports’ International Show Jumping Festival. Riding her own 11-year-old Danish Warmblood gelding Pacord, Potter clinched the blue in this three-phase competition with a win in the jumping phase and a stylish work-off that included an extra inside turn. But for trainer Leslie Steele, this talented and dedicated young rider has been knocking on the door of victory all season long and Potter’s win reflects the culmination of months of concentrated hard work. Potter started working with Steele, who is based at Acres West in Calabasas, Calif., just this past April. The two clicked almost immediately, with Steele providing the right amount of push and structure and Potter the work ethic and dedication. The farm is a nearly five-hour one-way trip from their home in Modesto, so Potter and her mother, Kristine, relocated to be closer. Payton attends school near Steele on Mondays and Wednesdays from 7:30-12:30, then rides all day on Tuesdays and after school on Wednesdays. “Sometimes on Sundays I will ride one of my horses after we get back from a horse show,” said Payton. Weekends are for horse shows or to return north to spend time with Payton’s father, John. It is clear that Payton’s parents stand behind her commitment to the sport 100 percent. “I am so very grateful to my parents for being so amazing and helpful and to adjusting to this move,” said Payton. For her part, Payton says that the culture of the southern California show circuit has also been a significant change, with a higher caliber of competition and more people. “I like to think I have almost adjusted to it,” she said. Pacord is a former dressage horse who was imported three years ago for a jumper client of Payton’s previous trainer. She says that her family knew he was the horse of a lifetime, so when he came up for sale, they jumped at the opportunity. “His favorite treat is Sour Patch Kids,” said Payton. “He likes to lick me.” Payton competed Pacord in the children’s jumper divisions before turning him into her main equitation mount this season. The USHJA 3’3″ Jumping Seat Medal was conceptualized to help provide to junior riders a stepping stone to the Platinum Performance/USEF Show Jumping Talent Search Program. This year’s finalists competed in both a flat and a gymnastics phase on Day 1; Day 2 featured a show jumping course and the final work-off. Each phase was progressively weighted, with the jumper course most influential. Judges Scott Williamson and Troy Hendrix evaluated riders on their equitation style and technical merit in all phases. In addition, 1 point was deducted for each second over the time allowed and 4 points for each rail during the jumping round. Flatwork has always been Payton’s nemesis; as Steele says, “God didn’t bless her to be 5’10” and all legs.” During this first phase, Payton rode with her stirrups a little longer to help stretch her leg and worked hard to keep Pacord packaged, which she says isn’t his favorite thing to do; she and Steele were both thrilled with her seventh place result. FEI course designer Anthony D’Ambrosio’s gymnastics and jumping tracks provided just the right degree of challenge for the riders, and the format suited the partnership that has developed between Payton and Pacord. Payton said that she enjoyed the gymnastics phase, which included a bounce, a five-stride/five-stride/five-stride pinwheel, and opportunities to add or omit strides. “That is Pacord’s favorite,” said Payton. Their strong performance placed them third in Phase 2, which was weighted 1.5 times. Payton says that once she recovered from her shock at being called back on top, she realized that her equine partner seemed to already know they’d won and was looking for the cameras. “He was ready to have his picture taken,” said Payton with a laugh. The megawatt smile Payton wore in the winner’s circle may not yet have worn off, but at the same time she is looking forward to meeting some other big goals this season, including competing at the Dover Saddlery/USEF Medal Final and ASPCA Maclay Final (Ky.) back east and hopefully winning a ribbon at the WCE Medal Final at the Las Vegas National Horse Show in November. Steele thinks that this breakout performance is just the beginning of things to come for Payton. “She is very strong and has a solid position,” said Steele. “She is someone who never thought she would qualify for these big finals, but she did, and in her first season.” Payton has set her sights on competing in the Platinum Performance/USEF Talent Search classes next season, as well as qualifying for the Hunterdon Cup and USEF Junior Hunter Finals.